North Cyprus attracts thousands of tourists and has become a favourite destination for holidaymakers and property buyers for years. With the picturesque villages, superb archaeology, the lush green landscape, golden beaches, perfect weather and the hospitality of the locals, Northern Cyprus has great things to do. Below is a list of things to do in North Cyprus which you can thoroughly enjoy. North Cyprus is located in the middle of the Mediterranean and offers the longest diving season with its warm and clear waters and myriad of wrecks. The calmness and clarity of the sea makes for excellent visibility in North Cyprus. There are several diving courses available in Kyrenia including Scuba Cyprus, Amphora Diving Centre, Nautilus Diving Centre and Turtle Bay Dive Centre. Adventurous visitors will enjoy paragliding which offers amazing views of Kyrenia coast. Tandem Paragliding in North Cyprus is offered by Highline Air Tours with professionally maintained and certified equipments. The set off point is the peak of Five Finger Mountains. Out skirts of Kyrenia mountain range offers excellent opportunities for walkers. Hiking the Kyrenia Mountains of North Cyprus is a privileged experience for visitors. With over 150-mile trail, it is one of the best kept secrets of the Mediterranean. It offers rugged scenery and superb archaeology and ideal for everyone. With some of the walking routes on the offer, you can visit 2 magnificent castles of Kyrenia, as well as its coast. Daily boat trips are organised from Kyrenia harbour. A boat trip is a great way of exploring the Kyrenia coast from the sea. You can enjoy swimming, having lunch on a boat, jet-skiing, and scenic views of Kyrenia casts on a boat trip. Boat tours can be booked at Kyrenia harbour. Since the establishment of Korineum Golf Course and Club in Esentepe, Kyrenia, North Cyprus golf holidays have become very popular on the island. Korineum is an 18 hole international standard golf course and country club designed for golfers of all standards and ages. Golf holidays can be booked direct with Korineum or tour operators offering holidays to North Cyprus. A privilege experience in North Cyprus is turtle watching. North Cyprus beaches are visited by turtles for thousands of years. This is a nature’s special gift to the visitors - a truly heart warming experience.. North Cyprus turtle watching is organised by Society for the Protection of Turtles. Escape Beach: This is the beach on the way to Alsancak towards west of Kyrenia. If you like a posh beach with a lot of amenities including great dining and wide range of water sports such as jet skiing and scuba diving, then this is the place to be. You can enjoy the sun beds either on the sand or on the grass. Escape beach is one of the most crowded beaches of Northern Cyprus. An entry fee is paid to enjoy what this beach has to offer. Golden Bay & Denizkizi Beaches: One beach but shared by two different hotels. This is another sandy beach in Alsancak, 10km west of Kyrenia. The beach offers various water sports. There is an entry fee for both beaches. Denizkizi beach also offers a freshwater swimming pool if you don’t like the salty water. Incirli Beach: This beach is located in Lapta, 15 kilometres west of Kyrenia. Incirli offers you a sandy beach as well as a deck where you can get to the sea. Here you can ride jet ski, eat in a cozy restaurant with Mediterranean kitchen. There are also 3 rooms for visitors where you can stop for few days or even for a romantic night. You can get more information about rooms from the restaurant's administrator. Kervansaray Beach: This is a public beach a 5 kilometres west of Kyrenia. Kervansaray Beach is another sandy beach where you can enjoy your day out in the sun. A small fee is paid if you would like to use sun beds and parasols. There is a nice restaurant available if you feel hungry. Camelot Beach: This beach is located in Alsancak about 12 kilometres west of Kyrenia. The beach is run by Girne American University and ideal for young people, couples and families with children. Karpas Golden Beach: This is one of the best beaches on Cyprus Island. Golden Beach is a mile long crescent of sandy beach curving along the northeast coast of Karpas Peninsula. The Beach is the only blue flagged beach in Northern Cyprus. It is recommended to spend a night at this beach which offers bungalows as basic accommodation. Don’t expect to find large hotels or tourism developments around. 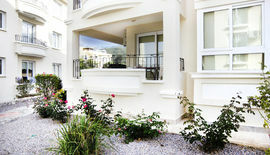 The nearest luxury 5 star hotel to the beach is Kaya Artemis. In a car, Golden Beach takes about 1.5 hours to get to from Famagusta. Glapsides Public Beach: This is a public beach near Famagusta centre and frequented by students and locals. If you feel hungry there is a restaurant available on site. This beach is ideal for non-swimmers and families with small children, as the water is very calm and very shallow. There are also water sports offered by the local municipality. Sun beds and umbrellas are available at a small coast. Northern Cyprus beaches don’t have lifeguards so it is advised not to swim drunk and on your own. Families should always watch their children. Always carry some refreshments.